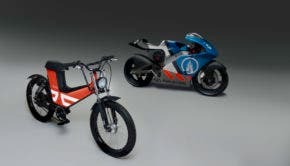 What could be better than an electric cargo motorcycle that carries up to 450-pound loads with zero emissions? How about 4 electric cargo motorcycles that come packaged inside a standard shipping container that is also a solar recharging station? Sure, an electric cargo motorcycle may not be high on everyone’s Christmas wish list, but think of the dozens of essential tasks police, fire, and emergency service organizations could find for these zero emissions beasts of burden with a range of 50 miles each. Current Motor_Mini-fleet-in-a-Box from Lauren F on Vimeo. Best of all, the modified shipping container they come in can fit in a conventional cargo truck and be hauled to wherever it is needed most. It can even be moved by helicopter, if necessary. Once it gets where it needs to go, it is self-contained, there’s no need to hook up to the local power grid. Its 22 kWh battery can be charged during the day and then used to recharge the bikes at night. It can also be an emergency power source for people living and working nearby. The container includes a radio communications center and mobile office options, according to TreeHugger. The Mini-Fleet In A Box concept comes from Current Motor in Ann Arbor, Michigan. “Current Motor’s Mini-fleet-in-a-Box uses 100% renewable, clean, solar generated electricity to charge our zero emissions Electric Cargo Motorcycles, making them among the most sustainable fleet options available. Current Motor green Mini-fleets are turnkey and self-contained, and literally work out of the box upon delivery to customer sites,” says Lauren Flanagan, executive chair of Current Motor. Current’s Nb model electric cargo bike can be fully charged in 5 hours. Once the solar powered home for the bikes is in place, it can be made operational by one person “in minutes,” the company says. No permits or additional engineering work is necessary. Maybe most of us think of a Tesla Model S when we dream of our ideal electric vehicle, but the Mini-Fleet In A Box could be a more practical solution for all sorts of critical missions in an emergency. It is just one more step on the road to a fossil fuel free society.